Does anyone remember the John Travolta movie Michael about an angel who behaves most unlike an angel? Nora Ephron wrote the screen play. Pie is very important to the plot of that movie and its off-beat treatment of disillusion and faith. So if you’ve never seen it, or if you have seen it, and the little song Andie McDowell’s character Dorothy sings on Michael’s command about loving pie is something that you have sung to yourself over the years every once in a while (come on, you know you have), then I hope you’ll enjoy this scene from the movie when her pie ditty first appears all over again. “Grease” your pie pan with about 1/4 teaspoon of almond butter. Chop the hazelnuts or almonds in the food processor. Add the dates and persimmon and process them a little. Then add everything else and process in pulses untl you get a nice “dough” forming itself into a ball. Press into the pie pan with your fingers. (Dip them in cold water if they get too gooey.) Sprinkle extra cinnamon and carob on the bottom of the crust if you like. Prick with a fork. Bake at 375 for 10-15 minutes and then cool on a rack. Process the dates and persimmon into a smooth paste. Add the cooked squash or pumpkin and process some more so they are combined. (This is especially important if you cooked your own squash and it hasn’t been pureed yet.) When the crust has cooled, pour the filling into it. Top with a little circle of reduced fat coconut in the center. Bake at 375 for 35 minutes. Cool on a wire rack, then refrigerate for a few hours (at least) before slicing. Just like Pumpkin Pie in the Free World. Notes: This is a light not too sweet pie. 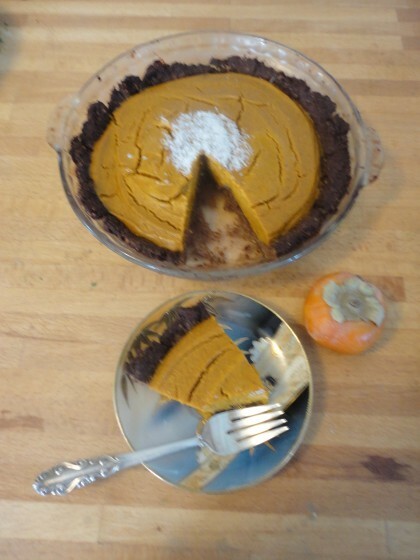 If you want the pie to be more sugar-sweet, use some, well, sweetener–stevia, maple syrup, coconut sugar, whatever. The way the filling tastes in the food processor is pretty much the level of sweetness you will get when the pie is baked. 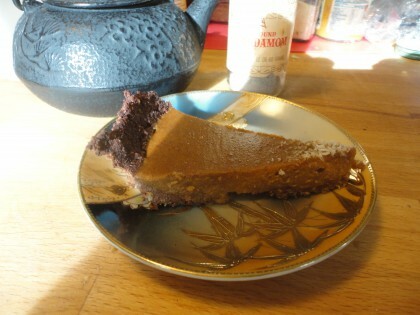 The nice thing about such a light pie is that you can eat more than one slice of it guilt free, and not feel too full. There’s a subtle range of variation that will occur, depending on what kind of squash you use, and the taste of the dates and persimmons. Some home cooked squash is more dry and heavy than others. Be sure your fruit is ripe and not too dry. Peel the persimmons, but you don’t have to peel the dates. If you use a banana instead of a persimmon, use about 1/2 of a very ripe banana with the dates. I haven’t tried this, but I also know 1/2 cup of mango would puree up fine in the food processor and I think it would be an absolutely delicious alternative in this pie. 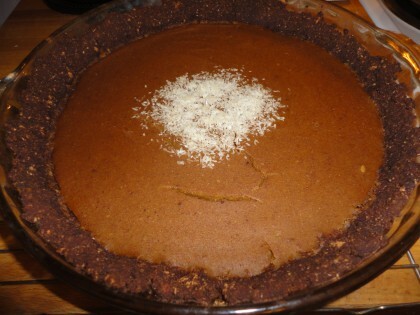 The texture of the pie will also vary depending on what kind of squash is used. 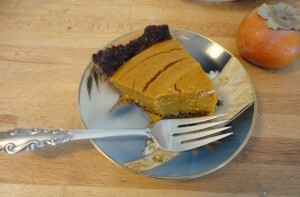 The two pies I photographed were made from two different kinds of squash–one a pumpkin of some sort (like the kind in my “A Great Pumpkin drawing), and the other red kuri squash (pictured in my post Pumpkin Pie in the Free World). 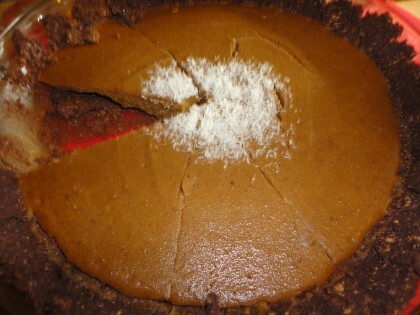 The red kuri was much more dry and the filling cracked more while baking. (That could also be because I was lazy and didn’t puree it by itself first.) But no matter, even with the cracks, it sliced up beautifully. That’s why in the persimmon version I added a little fruit rather than more carob, and “greased” pan pie pan with less than 1/4 teaspoon of almond butter. It came right up off the pan and stayed together. If some of you are telling yourselves you will make this with cocoa powder instead of carob, remember that carob powder is sweeter than cocoa powder so you will probably need to have sweetener of some kind in your crust. If you wanted a more rich and calorie dense pie, you could try using all coconut milk or more coconut in the crust. But honestly, that might be over the top in taste as well as calories. This little bit of reduced fat coconut and milk and/or extract is more than enough to give just a light kiss of coconut. More than that might overpower the taste of the pumpkin and the fruit and cause you to add more sugar. . .and on down the slippery slope, which is fine, if that’s where you want to go. I like staying here, though, where I can have two pieces at a time if I like and no regrets. Rich as it looks, this pie is a bit like those so called two-ingredient cookies. You can have a lot if you want to. And now that I’ve sung the praises of this pie, I have a confession to make. I came up with this to begin with because one of my favorite fall desserts has become a dessert dish full of cooked leftover squash with a dollop of the carob fudge from A Tale of Two Ingredient Cookies on top of it, and maybe a sprinkle of ginger, cinnamon, or cloves. But that’s too weird to bring to Aunt Millie’s, right? So I made it into a pie. For extra guilt free decadence, make a little extra of that fudge and put a spoonful on top of a wedge of pie. Oh me, oh my. Happy Thanksgiving, everyone. I’m so blessed to get to write for such amazing readers. Thank you for helping me have so much fun!! This sounds great! I love your confession at the end! I just had a bowl of butternut squash with a date and a couple of walnut halves for a snack this afternoon. Once I find carob again, I’ll make the fudge! This looks so delicious! I can’t wait to make it. I can’t see in the directions how long you bake the pie and at what temperature. Can’t wait to make this!! Hi Jo-Ellen–so glad you will try this out–and OMG forgot to add the temperature and times–it’s the same as Pumpkin Pie in the Free World–375. Bake the crust first for about 10 minutes, then after it cools, put the filling in and bake for 35 minutes at 375 also. I will go add this info right now! Thanks for pointing it out! Oh me, oh my, I am SO gonna make this pie! I made this for my family for Thanksgiving.it was super simple to throw together and baked up beautifully. It was delicious and everybody loved it. The millet crust had a texture somewhere between a traditional crust and a graham cracker one. We skipped the coconut (didn’t have reduced fat) and used canned pumpkin. It was perfect! Thank you! Sounds delicious! What do you mean by reduced fat coconut? Do you mean reduced fat coconut milk? cream? flakes? I use a small amount from this small container and then put the whole thing in the freezer, thaw it out and use a little more again, when I want a small coconut kick, but not too much saturated fat. Hope you can find these products near you. If not, no worries, just use a little regular coconut on top of the pie if you want and some coconut extract in the crust. You could also use coconut extract in the pie, along with the vanilla and leave off the coconut. LOL, I love your confession, too! I mean, when we eat this way…why not? Great pie! Awful movie… Can’t wait to serve this pie for the holidays. Thanks Eric! 🙂 Glad you like the pie, movie notwithstanding. 🙂 Enjoy! Have been wanting to make this for a few weeks now, and finally got to today! It’s delicious, very easy to make, and I love that millet and persimmons are used! I also love that it is a healthy pie and I can eat many pieces! (: I had been avoiding desserts prior to this, now I don’t have to! Thanks for the recipe! I think it is wonderful and I am a bit of a pie crust recipe collector you know! In my opinion a pie-less person is not a happy one…. But I have never seen anyone not look at a pie and smile. have you noticed that too? No persimmons to be had here but I just have to shimmy about and try other fruits. Pear and chocolate? Orange and chocolate? I cannot ever recall having a plum with chocolate and I wonder… I should not to spoil the whole pie but a mini on the baking tray might be a good experiment (I agree with you.) We are all very unscientific mad scientists and our kitchens are places of mystery where things appear that the cook or the (fortunate or unfortunate guest) were not expecting at all. I am finding your posts so enjoyable. So many references and inter-connecting going on. It all makes fascinating reading (and sets me off on quests… Aren’t vegans or those on particular dietary restrictions interesting? Being an ideas person really lifts it all so much.